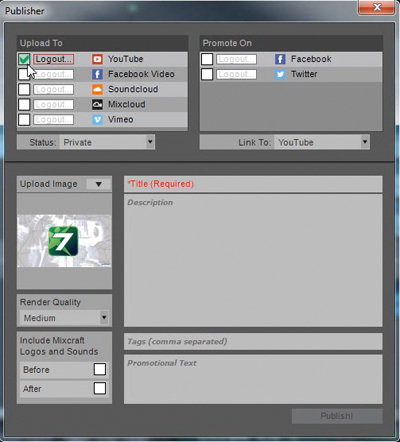 In this post we’ll discuss a super-neat new Mixcraft 7 feature we call “publishing.” The publishing feature lets you quickly render completed audio or video files and directly upload them to social media sites. In the past, once a song or video project was completed, you would render an audio or video file by choosing Mixcraft’s Mix Down To Audio File button. This creates an MP3 or WAV audio file, or in the case of video, a WMV or AVI file. You’d then direct your web browser to a social media site and follow the procedure for uploading. SUPER IMPORTANT NOTE: Publishing direct to social media sites requires Mixcraft version 7.7. To make sure you have the newest version, click on Help>Check For Updates at the top of the screen. Mixcraft is also pretty smart about site limitations, for example, if you’re uploading a video to an audio–only site (like Soundcloud), Mixcraft only uploads the audio portion. And if you’re uploading a song to YouTube (which requires some kind of image), Mixcraft lets you choose a cool built-in “Mixcraft-centric” image, or lets you use your own. For a detailed tutorial on publishing with Mixcraft, check out the video above beginning at 1:51. Thanks for the video on the new Publishing feature. It’s very informative. Great job. Where do i download the Microsoft.NET 4? I thought i downloaded it but it still wont let me publish my song. I love this feature, but it takes forever to render a video to youtube. Well, keep in mind that Mixcraft has to render the video, then it uploads to YouTube. I doubt it’s any slower than doing both steps separately. Seeking to purchase Mixcraft 8 Pro, thus Mixcraft 7 sample is brilliant, easy to use, nothing is complexed, also require some insight as to why you cannot be found on the web as to current Mixcraft 8. Look forward to your reply, shalom.